Before we study the uses of dots in different Ashtakvargas, there are two more factors to be studied. These are Zodiacal Product and Planetary Product . The total of these comes to 146. 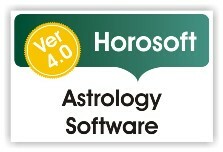 This is the Zodiacal Product for Sun. 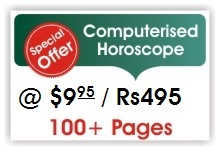 This way, the zodiacal products for all planets can be found out. These have been worked out and summarised in a tabular form below. As Sun is in 8, multiply the no. of dots in sign 8 in Sun Ashtakvarga, i.e. 0 by the planetary factor for Sun, which is 5. The result will be 0 ( 0 x 5). As Moon is in 7, multiply the no. of dots in sign 7 in Sun Ashtakvarga, i.e. 0 by the planetary factory for Moon, which is also 5. The results will be 0 (0 x 5). Similarly these have been worked out for all Ashtakvargas and shown in the following table. *Sodya meaning for which shodhan has been done, i.e. reduction. Some write it as pure or real. 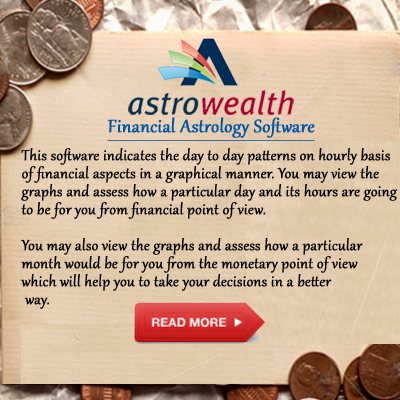 After calculating these products, let us now find out how to use these products. Divide this figure by 27, i.e. = 755/27 = 27 26/27. This means remainder is 26. Now count the 26th star from Aswini. This comes to Uttar Bhadrapad. Whenever Saturn passes over this star, there will be some trouble to father of the native. Divide this by 27, i.e. 550/27 = 20 10/27. This means remainder is 10. Now count the 10th star from Aswini. This comes to Magha. Whenever Saturn passes over this star, there will be some trouble to mother of the native. Divide this by 27, i.e. 186/27 = 6 24/27. This means remainder is 24. Now count the 24th star from Aswini. This comes to Shatbisha. Whenever Saturn passes over this star, there will be some trouble to brother of the native. Divide this by 27, i.e. 660/27 = 24 12/27. This means remainder is 12. Now count the 12th star from Aswini. This comes to Uttar Phalguni. Whenever Saturn passes over this star, there will be losses in the business/profession of the native. Divide this by 27, i.e. 960/27 = 35 15/27. This means remainder is 15. Now count the 15th star from Aswini. This comes to Swati. Whenever Jupiter passes over this star, there will be birth of a child to the native. No. of dots in the VIIth (before reduction) from Venus in the Venus Ashtakvarga = 4. Divide this by 27, i.e. 332/27 = 12 8/27. This means remainder is 8. Now count the 8th star from Aswini. This comes to Pushya. Whenever Jupiter passes over this star, marriage of the native may take place. Divide this by 27, i.e. 249/27 = 9 6/27. This means remainder is 6. Now count the 6th star from Aswini. This comes to Ardra. Whenever Saturn passes over this star, there will be trouble to husband of the female native. No. of dots in the VIIIth (before reduction) from Saturn in the Saturn Ashtakvarga = 5. Divide this by 27, i.e. 630/27 = 23 9/27. This means remainder is 9. Now count the 9th star from Aswini. This comes to Ashlesha. Whenever Saturn passes over this star, trouble to or even death of the native may occur. 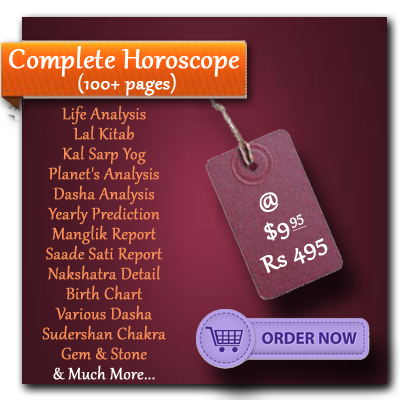 Thus, keeping in mind the basic principles of Astrology, these products can be used to find out several answers. Always remember to balance the picture in your mind. Try to tally the time being suggested by transit with the Vimshottari Dasha.